When an archer needs to shoot, he needs arrows to use with his bow. When an Olympic marksman needs to shoot, he needs bullets to use with his rifle. When a central forward needs to shoot, he needs to have the right technique with his feet, adequate strength his in legs, and deadly precision to put the ball in the net. There’s a reason why central forwards cost the most money in football: they’re what quarterbacks are to American football, they’re the ones who bring home the trophies and bring home the bacon. Despite playing some of the most entertaining football in Italy, Atalanta Bergamasca Calcio struggled to find a center-forward in its first two seasons under coach Gian Piero Gasperini. Roberto Gagliardini and Remo Freuler have impressed in midfield, Gianluca Mancini and Mattia Caldara have emerged as two of Italy’s most promising central defenders whilst playing in Bergamo, and Andrea Conti and Leonardo Spinazzola impressed as wing-backs too. But up until this season, Gasperini’s Atalanta were missing a prolific goalscorer to spearhead their attack. Alberto Paloschi, Andrea Petagna, and Andreas Cornelius were tried and tested but none of them were able to alleviate the pressure off supporting striker Alejandro “Papu” Gómez and attacking midfielder Josip Iličić. 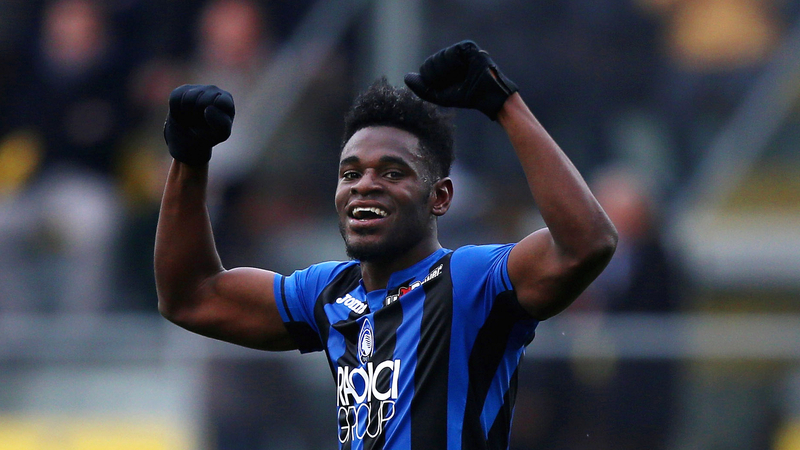 It was rather surprising for Sampdoria to let go of Colombian striker Duván Zapata in the summer of 2018, but he was allowed to join Atalanta on a two-year loan worth €12 million, with an option to be bought outright for another €14 million. La Dea haven’t looked back ever since. So far during the 2018/19 season, the 27-year-old Colombian international has scored 20 goals and provided five assists in 30 competitive games for the Orobici, including 15 strikes in 22 Serie A matches. Remarkably he found the back of the net 17 times in 10 matches, before his streak ended in the 1-0 victory against Cagliari on Monday evening. Zapata started slowly at Atalanta. Despite scoring two goals in the Europa League qualifiers, he had failed to score in his first 10 Serie A fixtures, but he broke his drought in the following round in a 2-1 victory against Bologna. Prior to the Round 14 fixture against Napoli, the Colombian striker had scored the solitary league goal and provided three assists. There were performances in which he displayed his strength and work ethic, but the finishing quality was always missing. He commenced his scoring streak in the 2-1 defeat at home against the Partenopei on December 3, and in the following round he scored a hat-trick in a 3-1 away victory against former club Udinese, with the best of the lot being the third, where his first-time shot remained low and curled into the bottom far corner. Next, Zapata found the back of the net with solitary strikes in a home win against Lazio and an away defeat to Genoa, before scoring twice in a 2-2 draw in Bergamo against Juventus. After receiving a through-ball from Papu Gómez with his back to goal, he performed a 180-degree turn past Juve defender Leonardo Bonucci and struck the ball into the net with his left foot. Eleven minutes into the second half, he tapped in a Gómez corner kick to give La Dea the lead, but a late Cristiano Ronaldo goal denied the home side a shock victory, keeping Juve undefeated in the league. Surprisingly he only scored once in the Bergamaschi’s 6-2 victory away to Sassuolo in the final league fixture for 2018, but he shined throughout the match, holding off Federico Peluso as Gianluca Mancini tapped home the fourth and holding up play for Atalanta’s attack. Zapata returned to goalscoring best after the Christmas break. An away trip to Frosinone looked easy on paper, and the Colombian proved that it was easier on grass as he went on to score four goals in a 5-0 rout. Mancini opened the scoring with just 11 minutes gone, and then Zapata made it 2-0 with a minute remaining in the first half, soaring above the defenders and heading in Mario Pašalić’s cross from the left. He scored his second just two minutes into the second half after Berat Djimsiti dribbled past two defenders and then softly passed the ball to the Colombian striker, whose left-foot strike bounced over Frosinone goalkeeper Marco Sportiello. Zapata completed the hat-trick after Hans Hateboer headed the ball down for him, and he volleyed it into the right corner. To add insult to the Canarini’s injury, he headed home the fourth in the 73rd minute, gaining separation from the defenders to score his fourth and go level with Cristiano in the Capocannoniere race. With that “poker,” as they refer to it in Italy, Zapata became the first Atalanta player since both Swedish centre-forward Hasse Jeppson and Danish forward Poul Aage Rasmussen in 1952 to have scored four goals in a Serie A game for the club. Roma was next, and although the Giallorossi led 3-0 in Bergamo in the first half, the Orobici pulled one back before half-time and came back in the second half to draw 3-3. Zapata blasted a penalty over the bar when the Bergamaschi were 3-2 down, but he atoned just a minute later, accelerating past the defense to slide a delicate right-foot shot past Lupi goalkeeper Robin Olsen. Afterwards, La Dea travelled to Cagliari for their next league fixture, but Zapata did not add to his tally and Hans Hateboer was the surprise goalscorer of the lone goal. Away from league action, he scored a goal and provided an assist in Atalanta’s 2-0 victory against Cagliari in the Coppa Italia in mid-January, and in the quarter-finals, he tormented Juventus once again, scoring twice in a 3-0 win, as the Lombard side ended La Vecchia Signora’s treble hopes. Zapata’s current form is stunning, especially compared to his previous scoring record. His highest league tally before this season came in 2012/13, where he netted 13 goals in the Argentine Primera División for Estudiantes de La Plata. That hot streak garnered the attention of Europe, but while West Ham failed to secure a British work permit for him, causing them to pull out of a potential transfer, Napoli snapped him up for €7.47 million. While he managed to score 16 goals for Napoli, with a ratio of a goal per 127 minutes, he failed to usurp Gonzalo Higuaín’s starting spot, and moved to Udinese on loan in 2015, and just 18 goals in 63 league matches for Udinese, and a ratio of a goal per 253 minutes. Early in his career in Italy, Zapata lacked the mobility to venture beyond the penalty box and create play, but he improved after moving to Sampdoria in 2017, displaying superior speed and impressive stamina. After Sampdoria exercised their purchase option, he was promptly sent on loan to Atalanta, who look certain to exercise their purchase option on the 27-year-old. Zapata believes that he has progressed since his arrival on the Italian peninsula, but he also credits Gasperini for improving his form and getting the best out of the remainder of the squad. “There is no secret, every year in Italy I have improved in terms of goals and performances,” he told Sky Sport Italia in early January. “This year I am with Gasperini, this experience will strengthen me as well as my teammates. Sampdoria fans might wonder would have happened if Zapata stayed in Genoa and maintained his partnership with Italian striker Fabio Quagliarella, who is in the form of his career, but Atalanta supporters are surely rejoicing that he has moved to Bergamo. A Coppa Italia semi-final against Fiorentina awaits, and if Zapata can keep up his hot streak, then the club will not only be aiming for their first trophy at the top level since 1963, but Champions League football as well. They sit just a point behind Milan in fifth place, and with Lazio, Roma, and Sampdoria in the hunt for top four, it is shaping up to be another breathtaking race for the final Champions League spot. Finally, Gasperini has the center-forward that his team has been crying out for, and their potential European aspirations are well and truly alive thanks to their Colombian scoring machine.